After going for a few months (several years in kitchen prep time) without a food processor, I can finally say that my kitchen is Food Processor equipped! To break in my new toy, my man, Chickpea, decided to help out! Inspired by nothing but the season and the chocolate chips hiding in the back of my cupboard, we got to work. In went the pumpkin and the homemade cashew butter, but instead of adding flour, the chickpeas jumped in instead! The food processor didn’t even bat an eyelash. I folded in the chocolate chips and chilled the dough for awhile to get it to firm up a bit and then into the oven they went. Because they are a little moister and have no flour, they do take a while longer to cook that your average cookie. They are worth the wait, though! I almost burnt my mouth trying one of these beauties as soon as they were out of the oven, but boy, were they worth the pain! 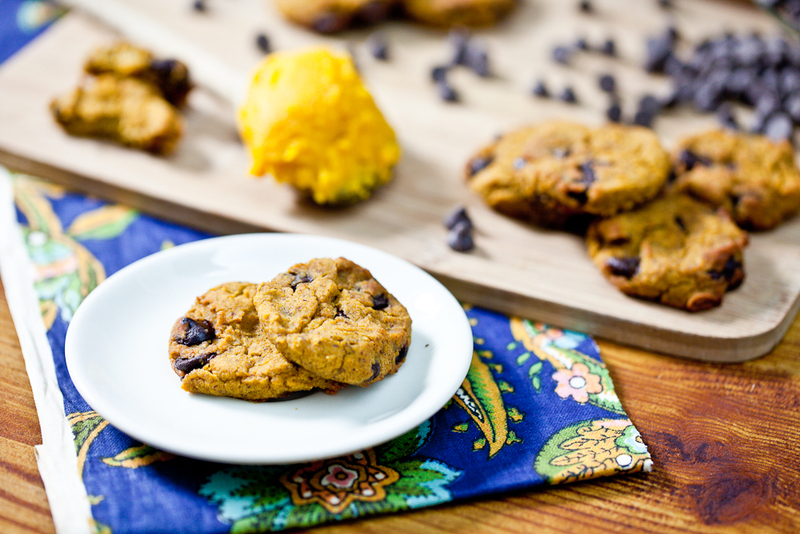 Slightly crisp on the outside, moist and chewy on the inside, pumpkin goodness throughout, chocolate chips in every bite… Is there anything else you could possibly desire from a cookie? What’s that? 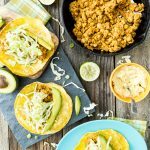 You want them to be healthy, gluten-free, and high in protein? 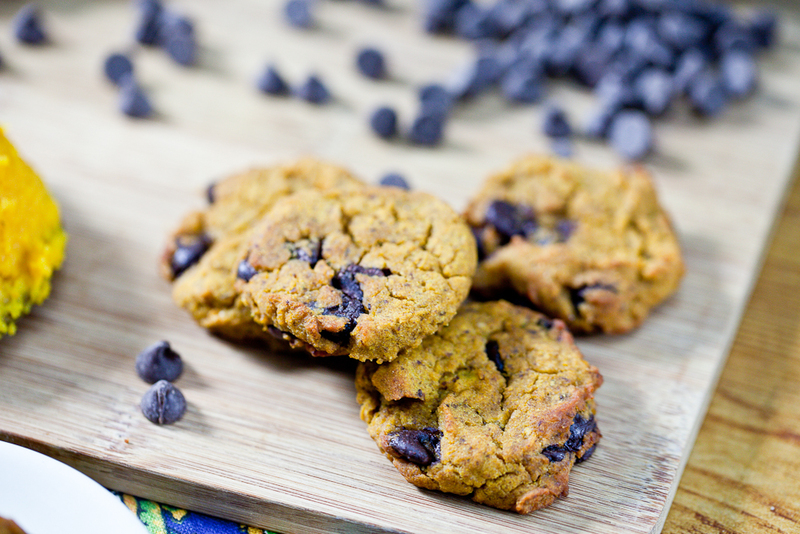 Well, these pumpkin chocolate chip cookies have that too! Maple sugar, pumpkin, and cashews are all nutrient dense ingredients that just so happen to also be delicious. No flour means no gluten (make sure your chocolate chips are certified gluten-free, if this is a concern), and all of those chickpeas ensure that each cookie is protein-packed. These are cookies that your tastebuds and your body will love. 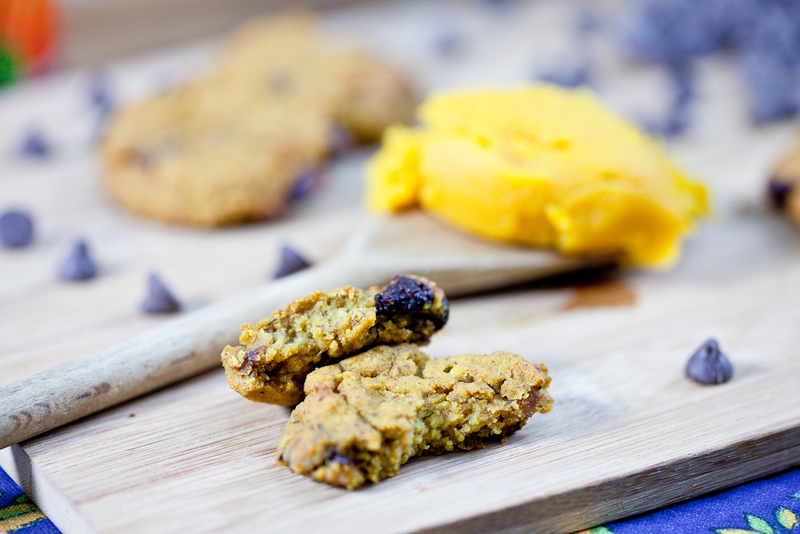 If you don’t have a food processor, don’t let that stop you from enjoying these cookies. Just use a masher to thoroughly mash all of the chickpeas before adding the other ingredients. Enjoy! Place the chickpeas in the bowl of your food processor. Pulse a few times until mostly ground, but not pureed. Add the rest of the ingredients, except for the chocolate chips and process until smooth. Pour the dough into a bowl, fold in the chocolate chips, cover and refrigerate for about 1 hour. Preheat the oven to 375. Line two baking sheets with parchment paper. After the dough has set, use a tablespoon to scoop heaping spoonfuls on to the baking sheets. Use the back of a large spoon or measuring cup to lightly flatten each cookie. Place the cookies in the oven and bake for 20-30 minutes (just keep an eye on them after about 20 minutes), until edges are slightly browned and the cookies have firmed up. Let cool on the baking sheet. Store the cookies in an airtight container in the refrigerator. Enjoy! 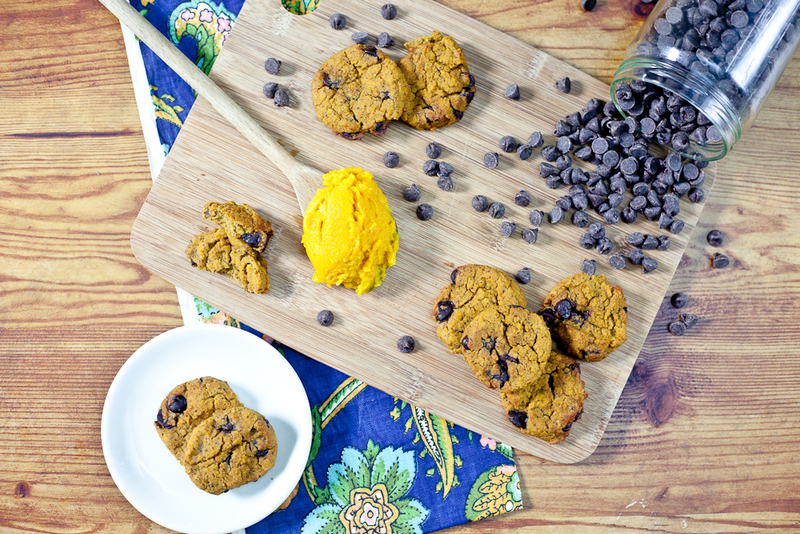 50 Responses to "Flourless Pumpkin Chocolate Chip Cookies"
Congrats on the new food processor – it’s hard to imagine living without one, once you have one! Also: Those cookies look aaaa-mazing! I’m really excited to try them, especially since I’ve never tried making flourless baked goods before! wow, lady, i’m super impressed by these cookies! NO flour? not even chickpea flour?! these are magical. i’m making these for dayv. Awesome! 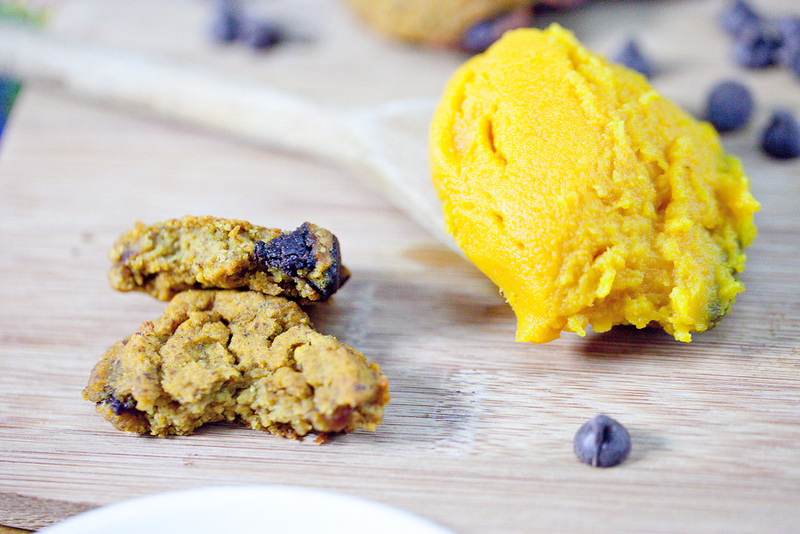 I haven’t found a pumpkin cookie recipe that I really love, mainly because they often end up very cakey. These don’t look cakey at all, very cookie-y like they should be! Who knew chickpeas were the answer? Looking forward to trying. I agree with you about the cakey-ness of pumpkin cookies, though I can’t say I don’t like them. I like cakey cookies but I like cookie-y cookies even more. Amazing, Kristy!! That little bean is something else. Thanks, Annie. Isn’t he, though? Sounds like a plan. 😉 I’m so jealous- a trip to Hawaii sounds so good right now! i need some pumpkin puree in my life soon 🙂 TGIF indeed. congrats on the food processor. i had a cuisine art one which was so bad that i had to throw it away. most of my small jobs are now done by the magic bullet. have a great weekend Kristy! my cuisinart was horrible, too! it made SO MUCH noise and did a terrible job! The new one is a cuisinart and so far, I have no complaints. What kind do you use? This time of year is all about pumpkin puree and finding new things to put it in. I had a mini cuisinart before and it worked well until it didn’t. I got a new cuisinart that I really like so far. It makes the old one look like a child’s toy. 😉 Have a good weekend, Richa! Ha! 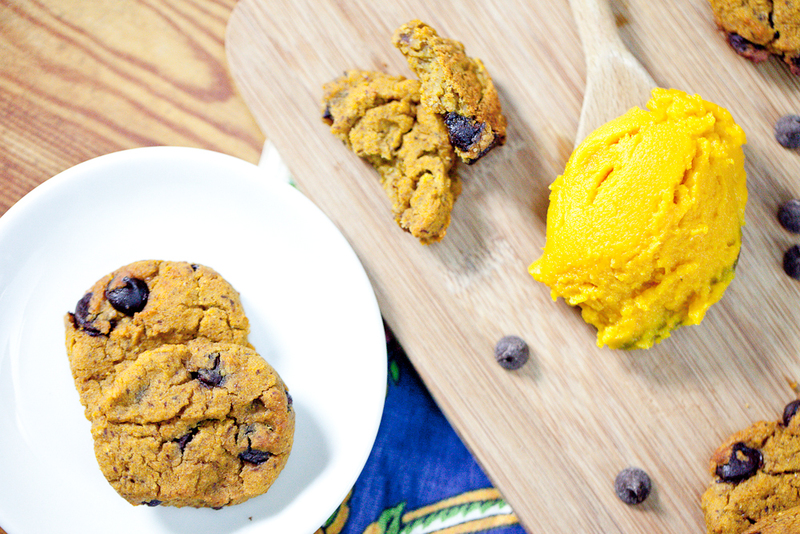 Love this I totally had pumpkin chocolate chip cookies planned as a MOFO post! Teehee, I’ll hold onto it for a bit, plus yours is more awesome cause it’s gluten free! Is there anything your man garbanzo can’t do? 😉 xoxo! 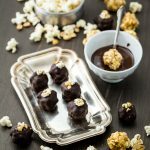 Got to try these, especially since I have a huge stash of chocolate chips begging to be used! Chocolate chips will do you no good being stashed away like that. Break ’em out, Andrea! 🙂 I hope you’re having a great weekend! They look so delicious…! Flourless cookies, This is just amazing!!! Thanks, Lysa! I hope you’re having a great weekend! P.S. Your new kitten is ADORABLE!!! as a big fan of chocolate covered katie’s cookie dough dip I WILL try these. yummy! Wow these look amazing! Probably the best looking chickpea-based dessert I’ve seen 🙂 Love the combination of pumpkin and chocolate too! Basically love everything about this post!! Ahhh-mazing! I have all these ingredients…I MUST TRY THIS! I would love to make these for my son to take to school, but he can’t bring anything with nuts. 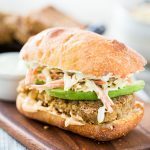 Any thoughts on a substitute for the nut butter? I know it is already gluten free, which I don’t need, but I love that it is high in protein and vegetable. If anyone has a thought I am all ears. I tried it with the soy nut butter and everyone loved them, but my son said they tasted more like a muffin than a cookie, they were a little soft I guess. Still they were gobbled up so I would say there were a winner. These are really delicious with a nice texture. This recipe is a keeper. I brought them to work, had so many requests for the recipe. No one suspected the cookies are vegan, much less made from beans. Be patient while they cook and cool, it will smell so good in the kitchen. Gail, you don’t know how happy this comment made me! I am so happy that you and your coworkers liked the cookies, and you’re so right, they are totally worth the wait. Thank you so much for stopping by! Wonderful idea! I’m all about pumpkin lately, and I am trying to cut back on my gluten. Thanks for the recipe. Thank you, Sarina! 🙂 Enjoy! 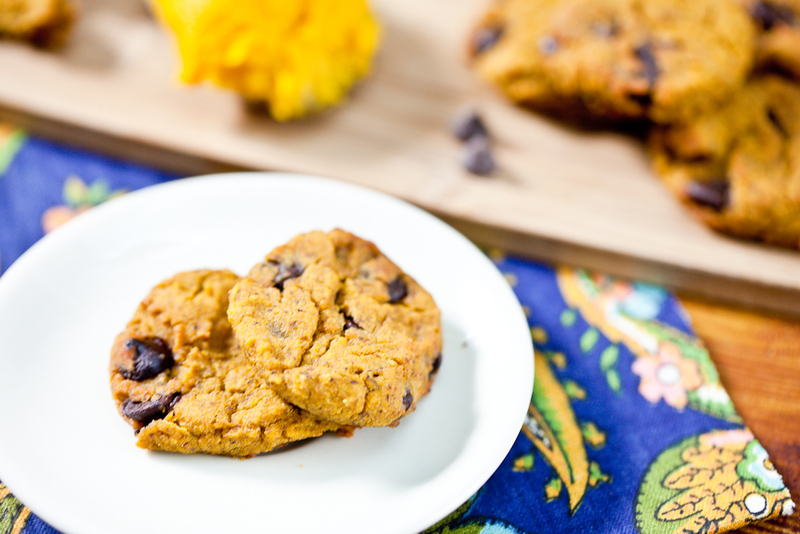 Its the perfect cookie Kristy- chewy/crunchy on the outside, moist on the inside, healthy with chocolate and pumpkin- YES! I have been gluten free for about 6 months now and miss cookies most of all. These are the absolute BEST I have made (and I have been trying cookie recipes at least twice a week). Not only are they delicious, but they have a great nutritional profile….except when I eat half a pan in one evening. Maybe they shouldn’t be quite so delicious (or I should be more disciplined). 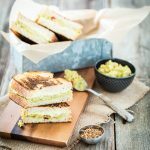 Thanks for your great recipes and posts. These are so good. They’re the only cookies I don’t feel guilty eating.